Q. Where can I find primary sources here at Western? 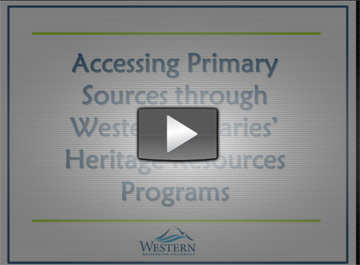 What types of resources are available through Heritage Resources programs? This web-tutorial gives an overview of resources at the Center for Pacific Northwest Studies, Western Libraries Special Collections and the WWU Archives and Records Center, with information about how to access primary source collections at these programs. Created by Rozlind Koester, Western Libraries' Heritage Resources, 6/1/2012. Length: 10 minutes, 29 seconds. In addition to the three Heritage Resources programs, the Washington State Archives (NW Regional Branch) is also located here on Western's campus in the Goltz-Murray Archives Building (Tel: 360 650 3125 Email: NWBranchArchives@sos.wa.gov). Ask an archivist or librarian if you need assistance finding primary sources on a particular topic. You may also wish to browse these research guides created by Heritage Resources and other Libraries' staff.